Banks and financial institutions are motivated to have good security measures in place, especially in the world of internet transactions, with ever-evolving rules. As well as general online security, which includes a unique user name and password, and a system which locks you out if you guess the combination incorrectly more than twice, Schwab has several additional (optional) verification methods. The first, a VeriSign protection device, is for use in accessing your account online. The device is about the size of a key fob, and pressing the button creates a code of numbers which can be entered in the password box. You enter your password, enter the numbers found on the VeriSign device, and are logged into the Schwab Alliance website. The numbers are visible on the device for a few seconds and then disappear. Pressing the button again calls a different set of numbers, increasing the security of your password. The second method is a verbal password which you set up, and which you are required to give whenever you call Schwab Alliance. Be sure you keep record of this password somewhere safe, as Schwab will not keep a prompt or hint anywhere, and if you do not know your password, they cannot give you any information about your account unless you go to a physical Schwab office and provide 2 forms of identification. If you wish, you can send a letter to Schwab to request these extra measures be placed on your account. Here is a sample letter. I would like to increase the security to access through the Schwab Alliance portal for all accounts in my name or held jointly with my wife. Henceforth, please ask me for my verbal security password. It will be “Snickerdoodle”. 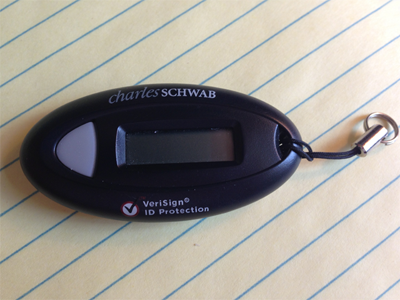 Also, please send me a VeriSign ID Protection device that would be required for access to my Schwab Alliance account.